From the elite collection of the infamous breeder "Kief Sweat", HSO presents the Ewe-2. Kief Sweat has maintained B-real of Cypress Hill's elite clones for over a decade in addition to developing a number of incredible uniquely flavored profiles that have expanded on his already diverse genetic line-up. This classic heirloom genetic has a pure Indica expression. Short and stout in nature, its thick broad leaves are supported by strong side-branching and an incredibly aggressive root system. Dense foliage maintains deep forest green shades as you can expect slower yet strong development through the vegetative cycles. Topping is recommended to create distance between the terminal buds, allowing for deeper light penetration. This girl will not stretch much, so it is important to grow her to the desired height as you may only see a 15% increase in size during the flowering period. Thinning fan leaves during the flowering cycle assist in rock-solid bud development all the way to the bottom of the stem. Large crown-shaped buds form quickly and hold substantial weight, as this is by far the largest producing Indica in the line-up. Impressively finishing in just 52+ days, this girl has an earthy overtone filled with sharp gassy undertones that leave you with a couch-lock style high. 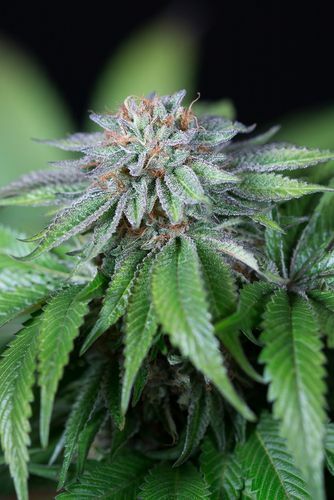 Powerfully cerebral, this Indica is great for pain relief and sound sleeping.